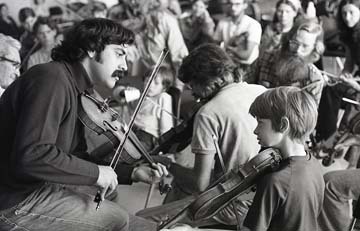 After helping Topanga Banjo/Fiddle with its contest in 1970, we launched our own Fiddlers’ Convention in 1972. I was faced immediately with a series of challenges, especially, how to define what we were up to, and how to best meet those goals. By 1972, I had been performing in Southern California for ten years, and had come to the realization that very few people in the state had a very clear idea of what old time fiddling, folk, old time, blues, and bluegrass musics — what is now somewhat condescendingly called “roots music” — were all about. This event seemed to me a way to help educate folks about their own musical heritage, and I began to tailor the Convention to meet this goal. First of all, though the Fiddlers’ Convention was prima facie a “contest”, I realized that there were not enough experienced musicians in the area to create a sustainable mass of contestants. I therefore established the categories “beginner”, “intermediate”, and “advanced” to level the playing field and encourage as many people as possible to participate in the event. The intent was to emphasize the sharing of music among all attendees. By 1972, the “Folk Revival”, welling up in the 1950s and early 1960s, had matured into an ongoing movement, including fans, “preservationists” and scholars, as well as those who built on the music to create a thriving newgrass, rock and pop music world. To further instill interest in more traditional forms of the music, I decided to feature a prominent performer, group, or musical sub-style as a theme for each years’ convention. Underlining this effort, we used early country music photos as components of our graphics: newspaper ads, posters, T-shirts, postcards, and buttons — which were handed out to all attendees. We combined Sunday’s convention with a Friday or Saturday night concert which featured that year’s musical theme. 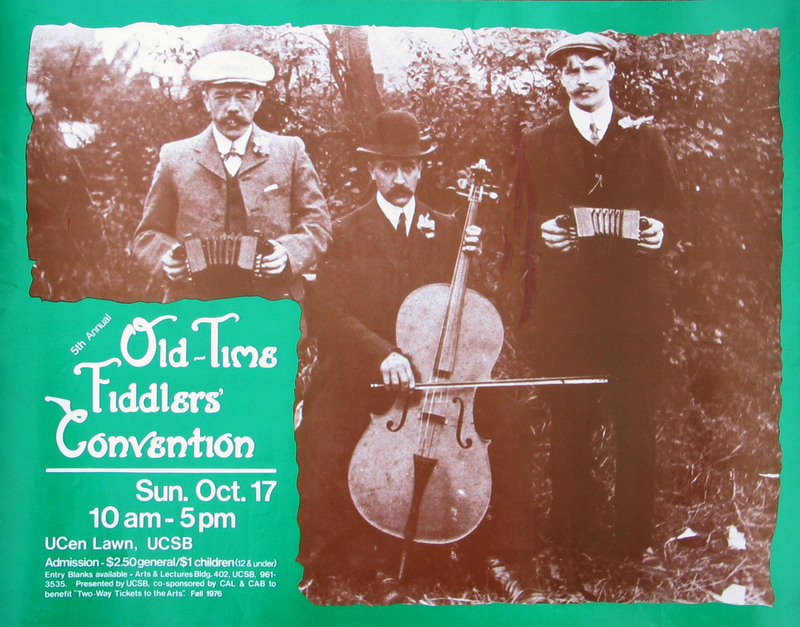 For example, the 1977 event was dedicated to the “Celtic Tradition”, featuring a Saturday evening concert by the Boys Of The Lough. Saturday afternoons, we added a lecture/workshop on the theme, all in an effort to educate our audience and build new friends for the music through a better understanding of the significance of its traditions. Celtic Poster OTFC, 1977 – click on image for large version. Other years’ themes included The Carter Family, Uncle Dave Macon, Fiddlin’ Arthur Smith, Reverend Andy Jenkins, Eck Robertson, and North Georgia String Bands. I was very fortunate to receive invaluable assistance from many sources: Professor Donald K. Wilgus, chairman of the Folklore Department at UCLA, along with many graduate students and other members, such as Michael Mendelson, Barry Hansen, John Fahey, and Mayne Smith. Eugene Earle at the John Edwards Memorial Foundation provided access to photographs and other documents. Peg Armstrong and her staff at Arts & Lectures, including Roman Baratiak, graphic designers Mona Worthington, Gerry Hill, and Monte Ferris turned my beginner’s efforts into a competent, professional operation, and gave it the impact it needed to make its place in the community. As a result, we had participants and fans from San Diego to the Bay Area and beyond as regular members of the convention. Since many people were coming from out of town , we tried to fill the entire weekend with events, such as the concerts and workshops, as well as providing lots of room for jam sessions, where some of the best music was regularly to be found. Earl Collins, far left, Tom Sauber, and Stuart Duncan. Many musicians local to Santa Barbara county opened their homes to visitors, had their own picking parties and often formed new duos, trios, and bands, ad hoc, to compete in the Sunday festivities. The original site, on the lawn overlooking the campus lagoon at the UCEN building, made a wonderful amphitheater. We were even graced, one year, by a streaker who, starting at the top of the lawn, raced all the way down to the water’s edge, jumped in, and swam across the lagoon to the cheers of the audience . . . In the next article, we’ll continue our saga of the early years of the Fiddlers’ Convention. Thanks for reading, and feel free to participate with your comments and memories. This entry was posted in General and tagged banjo, bluegrass, fiddlers, fiddling, Folk Music, Old Time Fiddlers' Convention, Peter Feldmann. Bookmark the permalink. This is just wonderful. Byron said Stuart was about 12 years old when he first met him. I will drag out some old photos of Stuart when we get to Guthrie. Look forward to your next article. Great stories, looking forward to more. I went to the first five “conventions,” then moved away from Santa Barbara. As with the Bluebird Café, it was a major part of my musical education. Thanks Peter! Dearest Peter~~ MANY thanks for many years of access to such great music and musicians! and BRAVO! to the Bluebird Cafe for being the site of FIRST RECITATIONS by poet ELENI SIKELIANOS, who is now well-published and is Professor of Literature at Brown University. The poem she read was, “I Had a Little Rooster.” HUGZ, Peter Feldmann!